More Reasons to Come to Earth Day on April 21! Hillhouse Farm and Nursery will have a wonderful variety of native plants including flowering understory trees, shrubs, and perennials for sale. Humane Society wildlife biologist, Dr. John Hadidian will present a program on humane ways to deal with beavers and other wildlife, followed by a demonstration of techniques to protect your property from beavers. Representatives from Energy Action Fairfax, a new Fairfax County program to help educate residents on steps to take to save energy at home, will be on hand to provide energy saving tips and answer questions. Lake Barcroft has been selected as one of only seven County communities for this new pilot project. As part of this program, the County will connect neighbors with energy experts, provide home energy assessments and deliver how-to instruction. Photography exhibit including fascinating historic photos of the lake after Hurricane Agnes, photos from the WID archive, and some fabulous wildlife and lake photos. Learn to identify and safely remove noxious invasive plants. Join Kay Cooper and Fred Abbey in an invasive plant workshop and demonstration. Get recipes featuring a few of our invasive plants. Here is the Schedule of our Earth Day events. 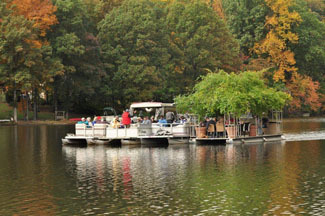 Eco-Barge Tours - Join Kevin Howe and George McLennan for a delightful tour of the lake and learn about our watershed. Shop for stunning native plants at the Hillhouse Farm and Nursery sale. Owner Janet Davis will help you select the perfect plants for your garden. Master Gardeners have the answers to all your gardening questions! Betsy Washington and other designers will be on hand at the RPA garden to help you make your property more watershed friendly and design tips to turn it into a beautiful oasis. Energy Action Fairfax will demonstrate techniques on saving energy in your own home. Enjoy an extraordinary Photography Exhibit curated by resident photographer, Larry Golfer with Tom Donlan. Student Art Show - Those 18 and younger are invited to bring and hang their art work on our Art Line for all to enjoy. Prepare to be amazed by the creativity of our talented Lake Barcroft youth. Make a work of art or collage in our hands on workshop with Art Teacher, Mert Cook. Join Davis Grant at the WID tent and see their new Watershed Map and learn about all that they do for the lake. Buy a raffle ticket to win Eco-prizes, such as your own Lake Barcroft Eco-cruise, special plants and trees, or a work of art by some of Lake Barcroft artists. 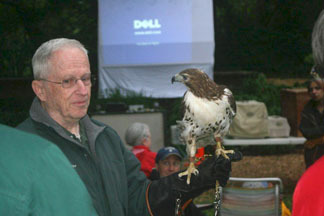 3:00 - 4:00 Don't miss Kent Knowles, Director of the Raptor Conservancy of VA and his live Raptor Program! You definitely don't want to miss this. Enjoy dinner with grilled hotdogs, hamburgers and drinks prepared and sold by the J.E.B. Stuart High School Crew Team. Interactive Watershed Model and Erosion Table demonstrations continue at 4:30. Don't Miss the Raffle Drawing for great prizes!